While the EU loads its canons for a threatened trade war with the US’ Trump Administration, Norway’s foreign minister has decided to “sit still in the boat,” as Norwegians are fond of saying. Norway has no immediate plans to strike back, but reserves the right to do so if it deems necessary. That’s a different strategy than the one being taken by the EU. Its officials have responded to Trump’s threatened 25 percent import duty on steel and 10 percent on aluminum by threatening high reciprocal fees on American products, from Harley Davidson motorcycles to cigarettes and Levi’s jeans. The goal is to make sure that the US is hit just as hard as the EU would be if Trump moves forward with his controversial plans. Norway’s own exports of steel and aluminum, the latter being the major product of the large state-controlled industrial firm Norsk Hydro, are mostly sent to Europe. Less than 1 percent of Norwegian exports of products convered by Trump’s threatened fees go to the US. Norway thus doesn’t stand to be hurt in the first phase. 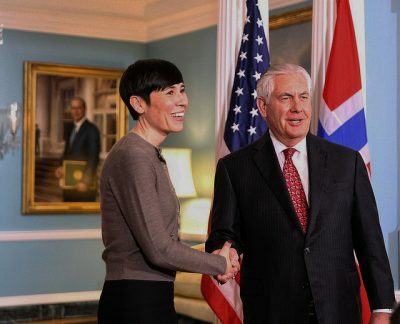 “I’m more worried about the indirect consequences for Norwegian business, if an already demanding situation in global markets worsens,” Søreide stated. Norwegian officials are in principle opposed to trade restrictions, except those it places on imports of agricultural products to protect Norwegian farmers.